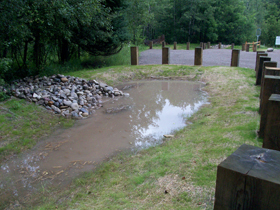 W e partnered with the Kalkaska Conservation District to install a bio basin at RuggPond in the Rapid River subwatershed. Bioretention and Biodetention basins are shallow depressions containing soil and plants to retain and filter water. This demonstration project helps reduce runoff in the watershed that reaches Grand Traverse Bay from streams and rivers when it rains. Runoff carries sediments and excess nutrients, which our EPA-approved Grand Traverse Bay Watershed Protection Plan finds are the two largest threats to the Bay and its watershed. 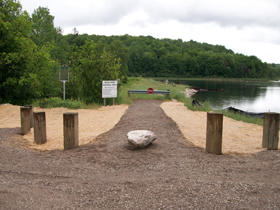 This project was completed thanks to funding from the Michigan Department of Environmental Quality.